You’re probably going to hear this a lot from Stargate fans. Any Stargate is better than no Stargate. That is how I feel about Stargate Origins now that I’ve had time to watch it through twice and let the story really sink in. I had planned to do episode recaps but since they are so short I decided to just do one overall review. MGM dedicating an entire streaming platform (Stargate Command) to just Stargate should say enough about how seriously they take this franchise. Unfortunately there are a lot of problems that I think arise from it. The first is the All Access Pass that we have to pay for. While it gives you access to everything Stargate for only $20, it does have an end date. What happens after that is anyone’s guess. I have seen lots of people asking on various social media platforms about what happens after that May 15 date with no answers. Stargate Command is flat out buggy. Both the website and app are lacking in up to date streaming functions. Pausing a video and switching to a different app will cause the video to restart at the beginning. It also does not track which episodes or movies you’ve watched in the past. Good luck to figuring out which episode you left off during your rewatch. The controls are also lacking as they are almost nonexistent. People are always reporting of it crashing and I personally experience how slow it could be. I had a better time with the website than the app which would take a long, long, time to load. The whole thing feels like it was rushed and launched before it could be fully developed. If that’s not the case then MGM needs to bring on a new team to help redevelop it. The forum and the feed are both interesting features. However, I have never been one to use forums so that’s a part of the site I don’t see myself utilizing. The feed on the other hand has also been a sore spot for fans. While there have been plenty of issues with the platform, the team still seems to be able to push out quizzes and other non important things. This has left people with a sour taste, wondering why such frivolous content is being prioritized over actual functionality. I understand that they wanted this to be done as a web series that could launch episodes weekly, but that feels so outdated at this point. Most shows available only online are still full length episodes, not 8-15 minute long snippets. I would have happily come back each week for a 45 minute episode. But only getting a glimpse of the story each week was almost painful. Don’t even get me started on the stupid spinning transition effect before the credits. In all, the 10 episodes are about the length of a movie and I hope that they will release the entire thing as one video. Having to watch a little bit, hit credits and start over on such short pieces takes the joy out of binge watching. Of course, being able to access the episodes anywhere I have a signal on my phone makes up for some of it. This is the first Stargate series to take place in the past. While we’ve seen glimpses of the time between unearthing the gate and the events of the original movie, this is the first real story that takes place in that time. This story focuses on Catherine Langford, her father, and friends. The first shot is of the gate being dug up from the original movie and Catherine picking up the Eye of Ra medallion necklace. When the series actually begins, the Stargate is about to be shipped off to America. The story focuses on Catherine and her two friends, Captain James Beal and Lieutenant Wasif Alabu Khan. They follow her father through the gate to Abydos after he’s been kidnapped by a Nazi occultist (Brucke) with his documentary crew. Initially Cat is held captive by a soldier that’s been left behind but she manages to escape and enlist her friends help to redial the gate. Once on Abydos, Langford, Brucke, and company seek out whoever lives in the temple. They meet the Goa’uld Aset. Ra allows her to maintain the mining planet that produces his Naquadah. It becomes clear that she is only biding her time until she can overthrow Ra, breaking many of the system lord’s rules. This is includes the harcesis child that her guard Serqet is disgusted by. Using Langford as a translator, Brucke makes a deal with Aset to trade millions of salves from Earth for shipments of Naquadah. Meanwhile, after coming through the gate Catherine and her group face off with Serqet. Using the ring device controls to send her away, a young Kasuf (yes the same character from the movie/series) leads them out to his small settlement. They are captured and a struggle ensues where Wasif is mortally wounded by Motawk. He and Kasuf immediately save him by using a device called the Hand of Horus, a gift from Aset. Over the course of the series we see that her style of rule is different than Ra’s. She is kind to the people, keeping them happy and thus they are more productive. While Aset and Brucke work out their deals and learn about each other’s cultures, Catherine and James grow closer. The village sees her necklace and believe (just like in the movie) that they have been sent by Ra. It also becomes apparent that Brucke is only interested in usurping Hitler’s power just as Aset plans to do to Ra. He begins to film propaganda with Aset. Next we see Catherine’s group at a feast. She and James smoke a pipe offered to them. Kasuf’s outpost puts on a play that depicts Aset’s fall from Ra’s favor but is risen up again to govern his people. She gifted the Hand of Horus to them in exchange for loyalty. Motawk also offers whatever is in the pipe to Wasif and we see the two of them grow close. The more Catherine smokes, the clearer her mind becomes on her task. James has to stop her from running out in the middle of the night to stop Brucke. Aset brings Brucke, Langford, and his group to Kasuf’s outpost. Catherine and James wake up and Kasuf enters the tent to let them know that she has arrived. He attempts to bring them out to present them. However when they realize who is with her, they stay inside. Brucke insists on a test between a member of the outpost and his soldier, Stefan. The soldier is losing so Brucke intervenes and shoots the other man, Nubai, in the head. This angers Aset. Brucke then kills Stefan after she threatens his life. The villagers beg Aset to save Nubai but instead as a show of power she destroys the Wand of Horus. Unfortunately this turns the people against her. Catherine, James, Wasif, Kasuf, and Motawk form a plan to rescue Professor Langford and kill Brucke. Kasuf takes Catherine to the cave where their only writings are and the gate address back to Earth. That same cave from the movie! After writing down the gate address, Catherine breaks the bottom portion off and buries it in the sand (where it isn’t found again until the movie years later). Meanwhile Aset and Langford discuss Catherine since he is the only one of his group to understand the ancient Egyptian. He assures her that Catherine will cause no trouble for her. As Brucke prepares to head back to Earth, the group storms the temple. Langford tells Aset the truth about Brucke’s treachery and she orders he be freed just as Ra shows up. Catherine shoots Brucke to protect her father but Langford stops her from killing him. However, Eva, still upset over Brucke’s actions shoots him to stop him in the name of Hitler just before Serqet kills her. In the end Aset erases Catherine and her father’s memories when she learns of their relationship but places the seed in her mind to return to destroy Ra. We are led to believe this is because she has born a child herself. Kasuf’s mind is erased as well and he is sent to the large village to lead the people. Serqet has informed Ra of Aset’s plans and she goes to serve him. Wasif and Motawk are turned into brainwashed guards that are seen again in the movie. Unfortunately James is killed after getting Catherine and her father through the gate. Ra destroys Aset, her child, and temple but not before the seeds of his own destruction have been sewn. I can be pretty forgiving when it comes to a budget. However this series made some major mistakes with the little they had. First and foremost the gate is not up to par at all. Yes, it looks like the one in the movie and not the series but it still looks cheap. If MGM was wanting to reboot the movie years ago it would stand to reason that they could spare some extra money to rebuild the gate. The chevron movement during the dialing sequence isn’t smooth. This makes it look fake. The wormhole CGI is fine though for the small scale of the show. The sets are simple but detailed enough to convey the messages that they need to. The costumes and makeup for Catherine and the rest of the people from Earth seemed fine. The problem lies with Abydos. Aset, being a system lord is fine with the exception of the eyes. I get that the glowing effect might have been out of the budget but the weird off color contacts that are visible all the time isn’t worth it. Serqet is by far the worst though. Acting as both Jaffa and Goa’uld is confusing and left her with a questionable wardrobe and makeup. Instead of making her Goa’uld with the terrible contacts, it would have been nice to see her as a Jaffa in a position of power normally reserved for men. This would have made her costumes make more sense. Being that Aset is an underlord to Ra it would help maintain Serqet’s loyalty to him above Aset. As for the people of Abydos, I didn’t find their costumes too off the mark. There are of course exceptions like Motawk that were a little over the top but all in all I felt like they remained consistent with the rest of the franchise. 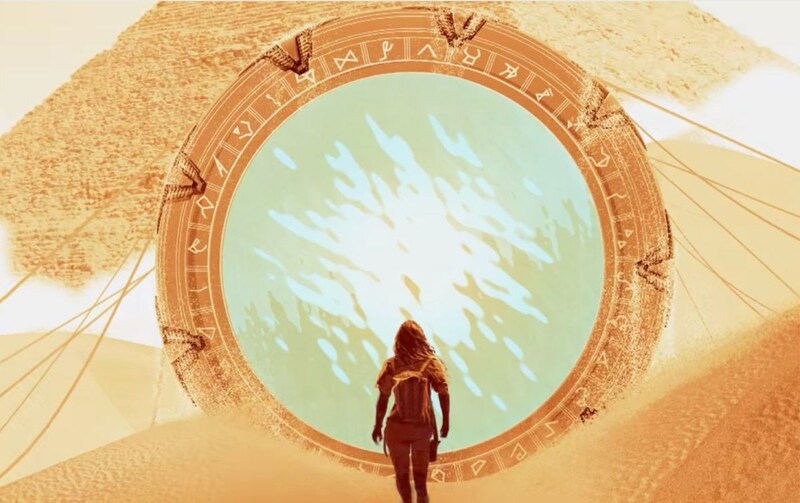 Stargate will never die. That is something that’s evident from the passionate fan base. It has suffered at the hands of SyFy and MGM’s bankruptcy but it will live on. This isn’t just fans grasping at whatever they can get though. The creators, writers, and actors all feel the same about it. The Dialing Home series showcases this. You get an inside look at how all of these people feel about the franchise. It’s nothing but love, respect, and the knowledge that it will live on. Alexis Cruz, who played Skaara in the original movie and SG-1 put it best. Stargate takes place in the now, not in some distant future. That makes a connection with the audience that most shows in the sci-fi genre can’t do. We can put ourselves in the shoes of the characters and that’s what makes it really special. I hope MGM takes that into account when they decide what comes next. Overall the acting was so-so, the visual effects were lacking, and the costume/makeup were underwhelming. The story was a great glimpse into Catherine's life and tied lots of things from the movie in at the end. This was a good first step from MGM and I can't wait to see something bigger and better.